Change ringing is an art form that has its beginnings in the 16th century. The only magazine that celebrates the art and science of change ringing is The Ringing World. The first edition appeared on March 24, 1911, and it has been published every week since then. A celebration of the centenary of the publication was held at Westminster Abbey on March 26, 2011. Dr. John Hall, the Dean of Westminster shed some light on change ringing and the popularity and meaning thereof. He stated that it was not only English-speaking people who loved the art form but people throughout Europe and the world. He regaled the story of his recent trip to the Abbey of Montecassino to celebrate the passing of St Benedict. He brought to light how an Italian monk, had declared his love for change ringing and that he was, in fact, an avid reader of The Ringing World publication. Bells are a way of drawing people together to worship and praise. Hearing the church bells ring stirs up emotions that are often buried within. The desire to praise God and develop a relationship with him is in everyone. This was the description put forward by Dr. John Hall to a crowd of believers who graced the abbey. Westminster Abbey has a peal of ten bells. These were cast by the Whitechapel Bell Foundry in 1971. The tenor bell, the largest of them all is tuned to the D note. 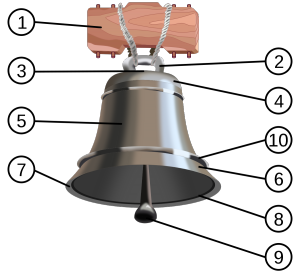 Eight bells were used prior to the year 1971. Of the eight, two are still in use. There are used before the evening service at the abbey. A bell bearing the inscription “Christus Audi Nos” is the oldest Abbey bell in existence. It was cast in 1310 and is now safely stored in a museum.